Sileo is the first FDA-approved treatment for dogs suffering from noise aversion, excessive fear, and anxiety caused by loud noises such as thunder and fireworks. 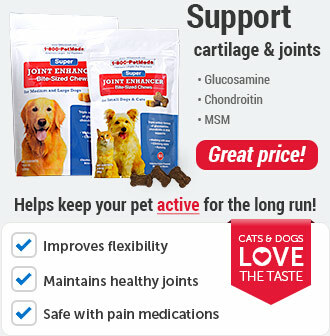 It is clinically proven to be safe and effective without other treatments or training. Sileo is fast-acting and easy to administer orally between the cheek and gum. This breakthrough treatment does not sedate your pet, so there is no interference with normal activity or attentiveness. Sileo remains effective for up to 3 hours, and should be given immediately after your dog shows the first signs of fear and /or anxiety associated with fear, such as panting, trembling, trying to hide or escape, refusal to eat, salivation, or inappropriate urination and/or defecation. 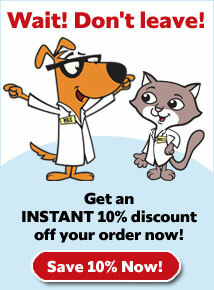 Sileo is available in a 3.0 ml oral syringe and requires a prescription from your veterinarian. Sileo is an oromucosal gel formulation of dexmedetomidine hydrochloride provided in a 3 ml syringe at a concentration of 0.1 mg/ml. Using the syringe, Sileo is easily administered between the cheek and gum, allowing for transmucosal absorption. Because Sileo is formulated to provide a low dose of dexmedetomidine, your dog remains calm, yet fully functional, and is able to interact normally with your family. Not for human use. Keep out of reach of children. 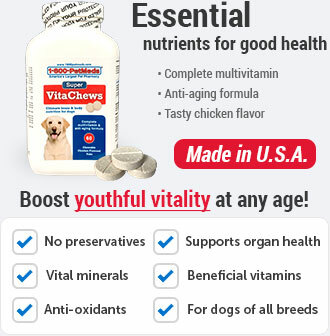 Do not use Sileo in dogs with severe cardiovascular disease, respiratory, liver or kidney diseases, or in conditions of shock, severe debilitation or stress due to extreme heat, cold or fatigue or in dogs hypersensitive to dexmedetomidine or to any of the excipients. Sileo should not be administered in the presence of preexisting hypotension, hypoxia or bradycardia. Do not use in dogs sedated from previous dosing. Sileo has not been evaluated in dogs younger than 16 weeks of age or in dogs with dental or gingival disease that could have an effect on the absorption of Sileo. Sileo has not been evaluated for use in breeding, pregnant or lactating dogs. Handle gel-dosing syringes with caution to avoid direct exposure to skin, eyes or mouth. See full Prescribing Information included in the package. Sileo is used for the treatment of noise aversion in dogs. 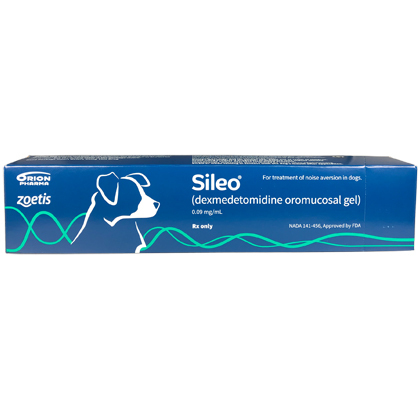 Sileo is available as an oromucosal gel that is presented in a 3 ml oral syringe enabling doses from 0.25 to 3 ml and requires a prescription from your veterinarian. Sileo is not meant to be swallowed. 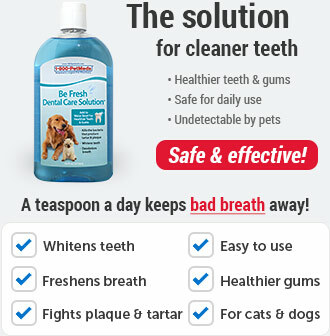 Instead, it must be placed onto the mucosa between your dog's cheek and gum. If Sileo is swallowed, the product may not be effective. If Sileo is swallowed, do not repeat the dose for at least two hours. Feeding and giving treats within 15 minutes after administration should be avoided. 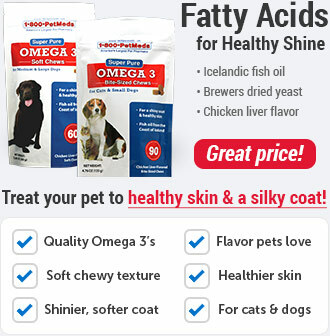 The amount of Sileo to be administered is based on your dog's weight. Each dose corresponds to the number of dots on the syringe (each dot (•) represents 0.25 ml of Sileo): dogs 4.412.1 lbs give 0.24 ml (1 •), dogs 12.2-26.5 lbs give 0.5 ml (2 •), dogs 26.6-44.0 lbs give 0.75 ml (3 •), dogs 44.1-63.9 lbs give 1.0 ml (4 •), dogs 64.0-86.0 lbs give 1.25 ml (5 •), dogs 86.1-110.2 lbs give 1.5 ml (6 •), dogs 110.3-137.8 lbs give 1.75 ml (7 •), dogs 137.9-166.4 lbs give 2 ml (8 •), dogs 166.5-196.2 lbs give 2.25 ml (9 •), dogs 196.3-220.5 lbs give 2.5 ml (10 •). For dogs weighing over 86.0 lbs, divide the dose between both sides of the mouth. If noise lasts longer than 2-3 hours and your dog's signs of fear and/or anxiety reappear, another dose may need to be given. To avoid overdosing, there should always be at least two hours' pause between dosages. No more than 5 doses can be given during one noise event. Transient pale mucous membranes at the site of application may occur with Sileo use. Other uncommon adverse reactions include emesis, drowsiness or sedation. Not for human use. Keep out of reach of children. The use of other central nervous system depressants may potentiate the effects of Sileo. As with all alpha-2 adrenoceptor agonists, the potential for isolated cases of hypersensitivity, including paradoxical response (excitation), exists. Sileo has not been evaluated in dogs younger than 16 weeks of age or in dogs with dental or gingival diseases that could have an effect on the absorption of Sileo. Sileo has not been evaluated for aversion behaviors to thunderstorms. The safety and effectiveness of Sileo in breeding, pregnant, and lactating dogs has not been evaluated. Administration to pregnant dogs may induce uterine contractions and/or decrease fetal blood pressure. IMPORTANT SAFETY INFORMATION: Do not use Sileo in dogs with severe cardiovascular, respiratory, liver or kidney diseases. 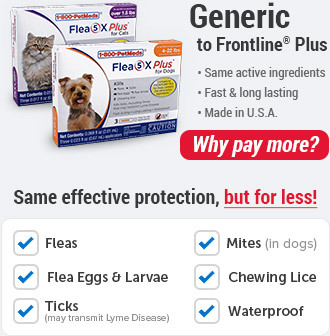 Do not use on dogs in conditions of shock, severe debilitation, stress due to extreme heat, cold or fatigue, or in dogs hypersensitive to dexmedetomidine or to any of the excipients. Sileo should not be administered in the presence of preexisting hypotension, hypoxia, or bradycardia. Do not use in dogs sedated from previous dosing. Sileo has not been evaluated in dogs younger than 16 weeks of age or in dogs with dental or gingival disease that could have an effect on the absorption of Sileo. Sileo has not been evaluated for use in breeding, pregnant, or lactating dogs. Handle gel-dosing syringes with caution to avoid direct exposure to skin, eyes or mouth. See full Prescribing Information included in the package. Avoid administering the product if you are pregnant, as exposure may induce uterine contractions and/or decrease fetal blood pressure. Appropriate precautions should be taken while handling and using filled syringes. 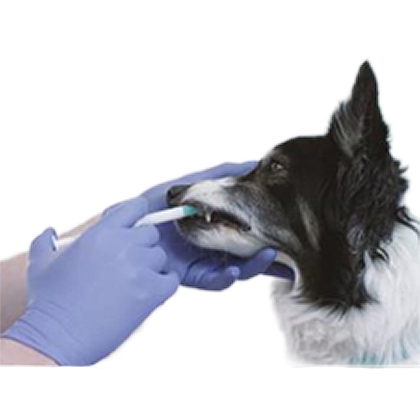 Impermeable disposable gloves should be worn when handling the syringe, administering Sileo, or when coming in contact with your dog's mouth after application. If skin is damaged, dexmedetomidine can be absorbed into the body. In case of skin contact, wash with large amounts of water. Remove contaminated clothing. Sileo can be absorbed following direct exposure to skin, eyes, or mouth. In case of accidental eye exposure, flush with water for 15 minutes. If wearing contact lenses, eyes should be rinsed first, then remove contact lenses and continue rinsing, then seek medical advice immediately. If the drug is absorbed into your body, it can cause symptoms such as lowered blood pressure. In case of accidental exposure, seek medical attention immediately. Exposure to the product may induce a local or systemic allergic reaction in sensitized individuals. Note to physician: This product contains an alpha-2 adrenoceptor agonist. Store unopened and opened syringes in the original package at controlled room temperature 68-77°F (20-25°C) with excursions permitted to 59-86°F (15-30°C). Use syringe contents within 48 hours after opening the syringe. The first dose of Sileo should be administered approximately 30-60 minutes before the fear and/or anxiety-eliciting noise stimulus, immediately after your dog shows first signs of anxiety or fear related to noise, or when you detect a typical noise stimulus (e.g. sound of fireworks) eliciting anxiety or fear in your dog. Typical signs of anxiety and fear associated with noise aversion are panting, trembling, pacing, seeking people, trying to hide, trying to escape, freezing behavior, refusing to eat food or treats, inappropriate urination or defecation, and salivation. Sileo should only be administered by an adult. If noise lasts longer than 2-3 hours and your dog's signs of fear and/or anxiety reappear, another dose may need to be given. To avoid overdosing, there should always be at least two hours' pause between dosages.No more than 5 doses can be given during one noise event. You can use a partially used syringe again within 48 hours after initial opening, if there is enough gel for a complete dose for your dog. To minimize the risk of incorrect dosing, do not use a partially used syringe that does not have enough gel for a complete dose. Any unused product or waste material should be disposed of according to local law and Federal prescription drug disposal guidelines. Ask your veterinarian for this information. Wear Gloves- Wear impermeable disposable gloves when handling Sileo and handling the oral syringe. 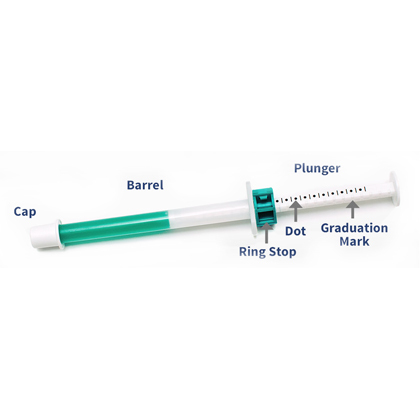 Hold Plunger- Hold the oral syringe so that you can see the dot markings on the oral syringe plunger. Unlock-Hold the plunger with your left handand unlock the green ring-stop by turning it toward you until it is able to slide freely. Move Ring- Move the ring-stop to the opposite end of the plunger. Lock-Hold the plunger with your right handand lock the ring-stop by turning it away from you. Unlock- Hold the plunger with your right hand and unlock the ring-stop by turning it toward you.DO NOT PULL THE PLUNGER. Move Ring- Move the ring-stop toward the other end of the plunger for choosing the correct dose based on your veterinarian's prescription. Set Dose and Lock- Position the ring stop so that the side nearest the barrel is in line with the graduation mark (black line) and the required number of dots shows between the ring-stop and the barrel. Lock the ring-stop by turning it away from you.Before dosing, make sure that the ring-stop is locked. Pull Cap (Tight)- Pull the cap strongly while holding the barrel.NOTE:The cap is very tight (pull, do not twist). Save the cap for replacement. Dose Into Cheek- Place the oral syringe tip between your dog's cheek and gum and press the plunger until the ring-stop causes the plunger to stop.IMPORTANT: The gel should not be swallowed. If the gel is swallowed, it may not be effective.If Sileo is swallowed, do not repeat the dose for at least two hours. Feeding and giving treats within 15 minutes after administration should be avoided. Back to Package- Re-cap the oral syringe and return it to the outer package as the product is sensitive to light. Make sure that the carton is closed properly. Keep the package out of sight and reach of children at all times. Remove and discard gloves. Use or discard syringe contents within 48 hours after opening the syringe. Do not rely solely on the ring stop to measure the dose. Watch carefully as you administer Sileo and be sure to stop pushing the plunger when it reaches the correct dot on the plunger shaft. Administering Sileo without use of the Sileo syringe will result in incorrect dosing, which may result in lack of efficacy or overdose. Each dot (•) represents 0.25 ml of Sileo. Each ml contains the equivalent to 0.1 mg dexmedetomidine hydrochloride. Keep the package out of site and reach of children at all times. Store unopened and opened syringes in the original package at controlled room temperature 68-77F (20-25C) with excursions permitted to 59-86F (15-30C). Use syringe contents within 48 hours after opening the syringe. 0.09 mg dexmedetomidine per ml (equivalent to 0.1 mg dexmedetomidine hydrochloride).